The scope of the Environmental Protection Agency expanded dramatically under President Obama. Now under President Trump and new administrator Scott Pruitt, the agency is likely to be scaled way back. How far back? No one knows. But there are a lot of clues -- including 7,500 pages of Pruitt’s emails. This week, while Pruitt started his job as America’s top environmental cop, emails from his tenure as Oklahoma Attorney General were released under court order. And they provide a window into how he’ll manage the agency he has spent so long attacking over his career. 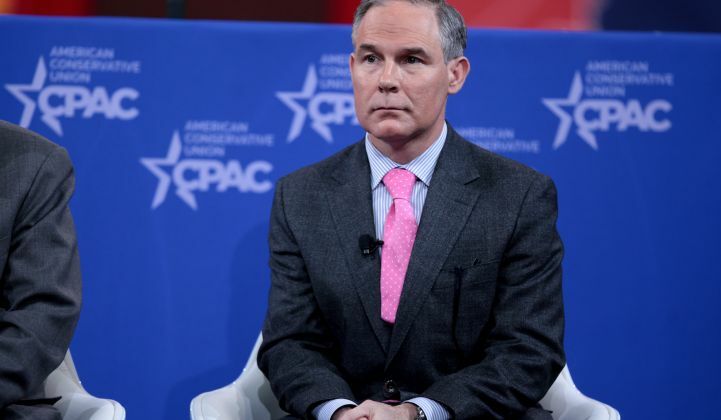 Climatewire reporter Emily Holden joins us to talk about the emails, Pruitt's approach to running the EPA, and the future of the Clean Power Plan. Then, autonomy is taking hold in the oil and gas sector, destroying tens of thousands of jobs. Will robots kill jobs in cleantech too?